HERROD — It’s a beautiful day.You’re sitting around basking in the weather and all the sudden you feel a buzz on your side. You’re not sure if it’s a muscle spasm or a phone alert. You hope for the latter. You’re hand reaches inside your pocket and the alert on your phone says on of the hundred pitchers in the Major Leagues is throwing a no-hitter. If the Northwest Conference had an app, Thursday night Crestview fans’ phone would have been blowing up, as senior Brant Richardson threw a no-hitter, in the Knights 2-0 win over Allen East. After the game the tall southpaw was nothing but smiles, and rightfully so. 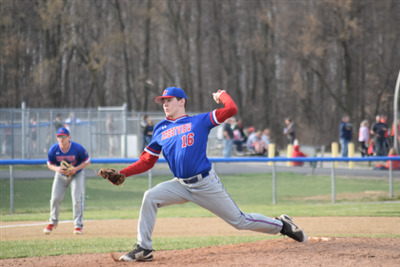 After a tough stretch for the Knights, this No-hitter was just what Crestview needed. Richardson just barely eclipsed 100 pitches on the evening, as he struck out 10 batters and walked just one. Though the Knights did make four errors in the effort. The senior was cruising until the seventh and final inning, in which a few Mustangs reached base and forced Coach Wharton to make a tough call. Take out your pitcher, who is throwing a no-hitter, or to put a reliever in the tight contest. On Thursday, Wharton made the right call and left the Southpaw in, as Richardson stayed in despite the game in the ballots. He didn’t waver though. A lead off walk, Richardson’s only of the game, led off the seventh. The Knights’ defense made an error that put the game tying run on the base, with only one out. After a mound discussion, the senior left hander put away the next two outs. Wharton came close to pulling his starter, but trusted Richardson getting the job the done. The southpaw knew the magnitude of the situation, but he still finished the game. Richardson did not jinx himself as the Knights finished the game, winning 2-0. Crestview didn’t do a whole lot of scoring Thursday, but they scored enough. In the second, Kole Small reached base thanks to an error, and was plated by Brody Brecht on a double down the line. Though they run would prove to be enough Kaden Short would come around to score following a lead off single. Short stole second and advanced to third thanks to an errant throw. Brant helped his own case by grounding out to second for the second RBI. The Knights will be back in action Saturday in Ottoville.